Surface area is prepped and contaminates removed followed by a hot water pressure wash at 200 degree heat. Primer is carefully applied to prepared porous and contaminate free surface area. The finish coat, which includes a clear coat, is applied last. Decorative color chips are added at this time if customer desires. 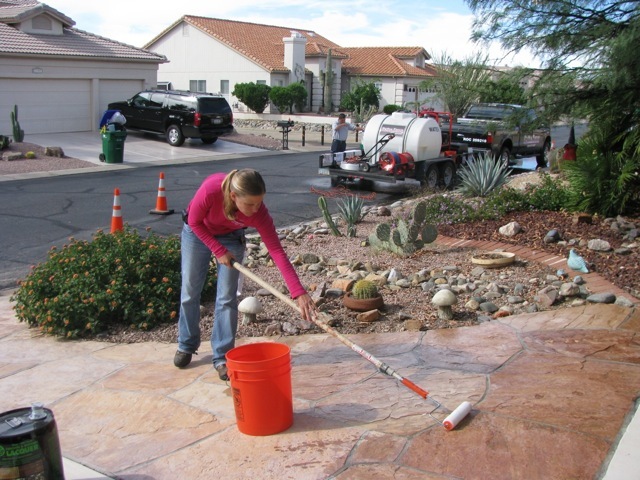 add protection and amazing color to your outside concrete areas, driveways, garage floors, porches. There are 90+ Sherwin Williams designer colors to choose from. The beauty of your newly coated concrete floors can be maintained for many years with easy soap and water clean up.